Last year, the global technology infrastructure company Switch announced plans to open a massive new SUPERNAP data center campus in Grand Rapids, Michigan. The centerpiece of the new complex is a unique Pyramid building. The five-story structure of glass, steel and concrete was built in 1989. It had been used as office space, and Switch began a major renovation to convert it to 225,000-square-foot of data center space, with the top floors as executive offices. As soon as the renovations got underway, it was obvious that the building had a significant problem. There was no cell signal whatsoever in the Pyramid’s basement. The basement was being outfitted to function as a critical storage hub, busy with employees. On higher floors, the cell service was a little better, but still not strong enough to support executive offices and corporate meeting rooms. The new campus would be storing valuable data for companies all over central and eastern North America. Prospective customers would enter the striking Pyramid building, remodelled in Switch’s signature red, and wait in the central atrium, which houses an enormous Foucault Pendulum. They would tour the underground storage facilities. Poor cell phone coverage was not an acceptable part of the customer experience. It also wasn’t good enough for Switch’s own executives, who would be frequent visitors between the Grand Rapids center and others in Las Vegas and Tahoe, Nevada. Finally, the finished campus would house hundreds of employees, all of whom needed to be reachable wherever they were on the campus (including the cafeteria, which was a cell dead zone). It wasn’t just a preference for Switch. Their core promise to data center customers is a guarantee of continuous up time. Every customer and every Switch technician needed to have reliable cell coverage, wherever they were in the building. With the building renovation ongoing, Switch needed a quick solution that could be rolled out before construction finished. RSRF had already designed and installed a passive DAS solution in their Core SUPERNAP campus in Las Vegas, and the company again looked to us to quickly bring great cell coverage to the new campus. The RSRF team visited for a site survey within a week of first being contacted by Switch’s Director of Network Infrastructure. On site, we confirmed the existing signal strength, discussed the building’s needs, and noted an existing antenna at the top of the Pyramid. 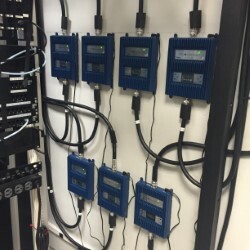 Our team designed a full signal solution for the building and had a full quote delivered to the customer less than a week later. For Switch, the solution was comprised of seven Wilson Pro 70 Plus Select amplifiers in the basement, five amplifiers for the ground floor, and a final amplifier to cover the top floor executive offices, covering a total of 370,000 square feet. As we tested the system in place however, we quickly realized that the existing antenna we had hoped to use just wasn’t able to provide the high gain we needed to support such a large system. We ventured up to the very top of the pyramid to replace the existing antenna with a powerful Wilson yagi antenna. With the new donor antenna and a total of 13 Wilson Pro amplifiers and 106 panel and dome indoor antennas, the Pyramid building finally had cell coverage equal to the impressive new renovation. Even the basement — where users had previously seen zero bars on their cell phones — had coverage on every carrier. Today, with strong cell signal and a sleek new facility, the largest data center in the eastern United States is open for business.